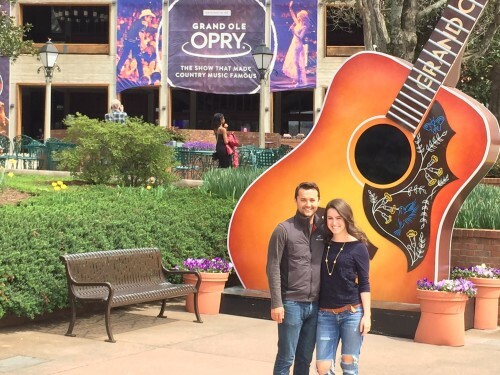 We had a great 24 hours in Nashville earlier this month. It was a quick trip – but we managed to do and see everything we wanted to in just one short day! The Hermitage Hotel – It’s the nicest hotel in Nashville, and also the priciest! The hotel is in Downtown Nashville, a few blocks from the Ryman and honkeytonk row. The rooms are a bit dated, but are elegant and classic in their design. We had a great view towards the Bicentennial Capitol Mall. Country Music – If there isn’t a great performance at the Ryman or Grand Ole Opry when you’re in town, not to worry! Nashville has the best country music in the world – and you can hear it at all hours of the day on Broadway. Our favorite country bar was Honkeytonk Central – the bands we heard were incredible! Visit Franklin – We took a quick drive to Franklin (a half hour away from Downtown Nashville) and loved it. It’s a cute little town without much to see other than cute shops, greenery, and quiet country roads. We enjoyed The Iron Gate, Haven Sanctuary of Style, and White’s Mercantile. Draper James & Sprinkles – Located next door to each other on 12th Avenue South, this is a fun quick trip from Downtown. Draper James is adorable, and you can never go wrong with a cupcake from Sprinkles! Country Music Hall of Fame / Hatch Show Print – The Country Music Hall of Fame is a beautiful building with lots to see and explore! If you’re a country classics’ fan, this is a must do. We also enjoyed visiting the Hatch Show Print Museum and Store. It’s a great place for souvenirs too! Frothy Monkey – Best coffee shop in Nashville, hands down. Thanks for a fun trip, Nashville!